It’s Official! 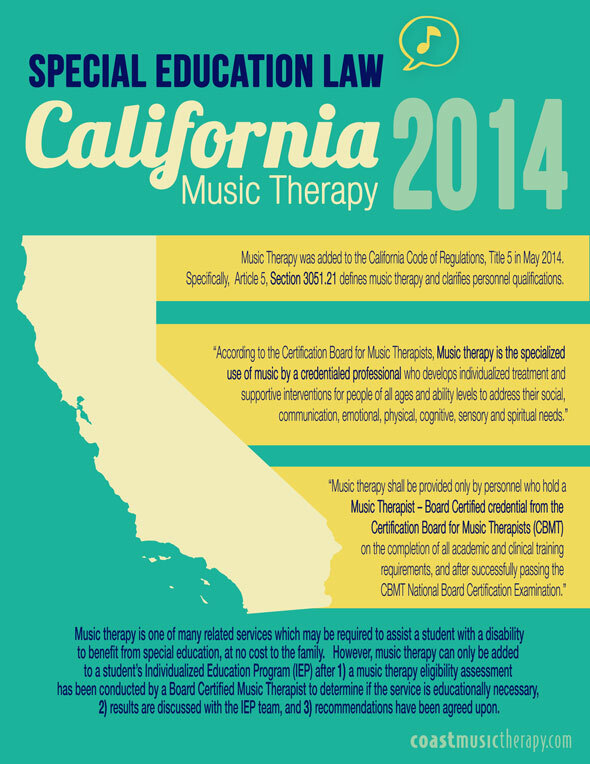 Music therapy has been formally added as a related service to California special education law. While not all students in special education require music therapy, the new regulations will help provide clarification for parents and professionals who are considering music therapy as part of a student’s Individualized Education Program (IEP). Students with disabilities in the Unified States are entitled to a Free and Appropriate Public Education (FAPE), under The Individuals with Disabilities Education Act (IDEA). This means that if a particular related service such as speech therapy, physical therapy, or music therapy is required for the student to benefit from their educational program, it must be provided at public expense by the school system and without charge to the parents. The music therapist conducting the assessment will look at criteria such as whether the student needs additional support to make adequate progress in educational goal areas, whether music offers a significant assist on goal-related performance, and whether music has been documented as a main motivator or learning strength. A student may enjoy music and even learn through it, but these factors alone do not guarantee that a student requires the service. Music therapy has been specifically recognized at the federal level by the United States Department of Education Office as a related service. However, California Education Code, although based on federal education law, did not specifically include music therapy within their list of related services until May 2014. 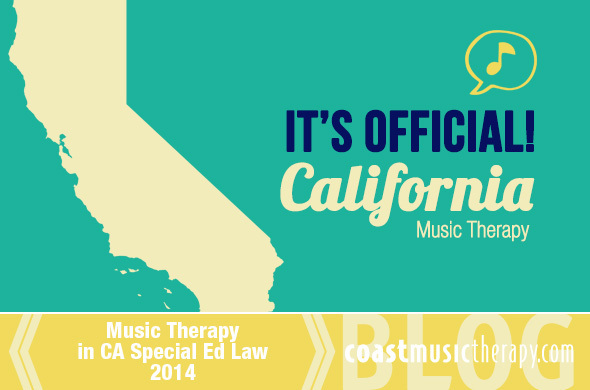 This exclusion of music therapy within the California Regs did not fully prevent students from accessing music therapy as a related service, but often made the process more difficult. A special thanks goes to the California Music Therapy Task Force, American Music Therapy Association, and Certification Board for Music Therapists. Their combined efforts, diligence, and professionalism made this landmark legal change possible. The new regulations below offer specific language regarding the definition and personnel qualifications for music therapy as a related service in special education. (b) Music therapy shall be provided only by personnel who hold a Music Therapist – Board Certified credential from the Certification Board for Music Therapists (CBMT) on the completion of all academic and clinical training requirements, and after successfully passing the CBMT National Board Certification Examination. The full text for these regulations is available on the California Department of Education website here as a Word document. SECTION 3051.21 is added to incorporate from proposed section 3065(l) language pertaining to the qualifications of persons who can provide music therapy. This section is also amended to include a definition of music therapy obtained from the Certification Board for Music Therapy. A definition for music therapy was added to the state regulations because the State Board of Education considers music therapy a valid related service to provide to students with disabilities, when appropriate. Through the proposed regulation, the board can educate the public that music therapists are certified, and the board can require that music therapists be certified before providing music therapy to students with disabilities. Further, some local educational agencies have denied students with disabilities access to music therapy citing the absence of a definition of music therapy and certification requirements in state regulations as grounds for denial. This regulation should help to provide students who are considered eligible by their IEP teams with access to music therapy as a related service. How is Music Therapy Provided through the IEP? In San Diego County, music therapy has been provided by Coast Music Therapy’s team of Board Certified Music Therapists through the IEP since 1999. Over 1000 individual student assessments have been provided for school districts throughout the county using a systemized assessment process designed for the special education setting. For students who do qualify for music therapy through the IEP, services are provided at the student’s school site and specific research-based music therapy interventions are selected based on the student’s individualized IEP goals. The music therapist is assigned to relevant goals and collaborates with the student’s teacher, therapist and family to assist them in continuing to use music to support the students goals throughout the week. Coast Music Therapy supports an integrated and collaborative approach to music therapy to assure that strategies can be carried over throughout the week by parents and staff such as teachers, speech therapists, behavior therapists, and paraprofessionals. Our staff develop and provide songs and other music-based strategies which are tailored directly to the IEP-related the student is working on, such as learning his/her phone number, math facts, early literacy skills, classroom rules, conversation, daily living tasks, turn-taking, following directions, appropriate behavior, imitation skills, or expanding speech. Music therapists may work with students at all grade levels, but age appropriateness of using music as an educational intervention, and whether goals can still functionally be supported by music therapy is considered during the assessment process. The music therapist continues to monitor over the course of the year whether the service still provides a necessary assist to the student’s progress. If at any time it is determined that the student no longer requires music therapy to benefit from his or her educational program, an IEP meeting is held and discontinuation of services is discussed. Click here or on the image below to download an 8.5 x 11 sized PDF version.